How can you have Lasting Purpose? As a citizen in the world community, it is your duty To Give, To Do, To Love and To Serve Out of a Sense of Abundance. Watch the video to learn more. We will not stop until everyone on the planet has access to chiropractic care and a chiropractic education if they so choose. We believe that members of a committed tribe can make the difference in helping Life University spread principled, vitalistic Chiropractic and Lasting Purpose around the world. Our tribe will not stop until we have established worldwide access to Chiropractic and a chiropractic education for anyone who wants it. We are establishing clinics and schools in China and Costa Rica, creating a world class think tank (Octagon) for thought leadership and social change, transforming chiropractic education and the campus, and creating a waiting list of students to get into Life University. The LIFEforce tribe is currently dedicated to two projects: looking for committed members and filling Life University with students who are passionate and will spread Chiropractic around the world, now and for decades forward. Why are we doing this? Because we are barely graduating enough DCs to replace those retiring or passing away. There are 1.1 million MDs in the U.S.; there are only 68,000 chiropractors. Worldwide, it’s even more dramatic. The European Union has 700 million people; there are less than 5,000 DCs. China is home to 1.3 billion people, and there are about 20 DCs. Life University is both committed to increasing the influence of the profession here in North America, and starting chiropractic programs throughout world. We need your help. If this partnership is of interest to you, become a member. LIFEforce is a group of Chiropractors who have committed to Changing the World. The future of the profession depends on where you send your students. To become a member of LIFEforce, sign up and start making a difference today. Join LIFEforce Tribe members and LIFE Leadership Weekend participants for a weekend in Atlanta. Life University has created a powerful vision for the college, our profession and Chiropractic worldwide. It all comes down to me; it all comes down to you; come join us. Think what 1,000 chiropractors, focused and switched on, motivated by Lasting Purpose, could do to make a difference in a prospective student’s life and in a world thirsting for our Principle. Will you join me in this quest? Will you become an ambassador of change, hope, and vision? Will you become one of ‘us’… a LIFEforce member? Six years ago, I decided along with a small group of friends to personally make sure Life University survived and would thrive. I decided the best way to do that was to send students. Since that commitment, I’ve been responsible for hundreds of students finding Life University and finding their purpose in life. And it’s all done by getting a few doctors together and hosting a simple evening for prospective students. We explain Chiropractic, the lifestyle of a chiropractor, what it takes to enter Life University and the Lasting Purpose principle. It has been the highlight of my career, and it will be yours, too. At the LIFEforce Insiders’ Weekend, the LIFEforce staff will give you everything you need, and chances are I’ll be there to great you as well. I just wanted to let you know how excited we were about our last LIFEforce training. Once we arrived, you could tell that Lasting Purpose is alive and well at Life University. When we entered the vastly upgraded campus facilities, we couldn’t help but comment on how beauty now meets form and function. We were not just greeted by staff and faculty, but welcomed as if we were returning home. Seeing the 2020 vision and the passion with which it is being presented made us excited and proud to be a part of LIFEforce, for the future of Chiropractic as well as Life University. The LIFEforce mission has been one of the most rewarding and gratifying experiences of my professional career. Most people need to keep their philanthropy, volunteer work, recreation and careers all separate. I look at it as a blessing and so congruent to be able to combine all those areas and energy in the same direction and for the same purpose. 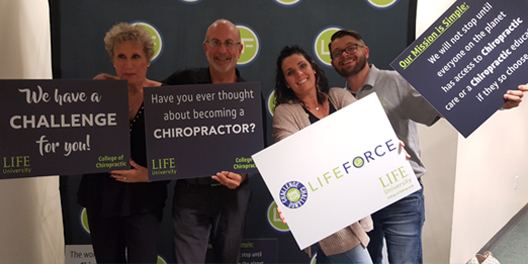 I was attracted to LIFEforce because it’s a group of like-minded individuals who share a common philosophy and belief in the power of chiropractic! !… LIFEforce provides an avenue to help guide high-quality individuals into a profession so that they can make a great life for themselves and impact others’ lives along the way.